I am beyond excited for today's post! After several attempts to score one of the famous Rainey necklaces from the fabulous Spike The Punch Etsy shop I finally got one and I am head over heels about it! Not only is the shop owner a total sweetheart, the shipping is fast, affordable & comes in a very stylish leopard package - yes please! These necklaces are big time commodity ladies - they sell out in a hot second and each time they are listed the colors are usually a limited edition and not to be seen again. While I will most definitely keep at it to offer you the hard to get/easy to love Rainey necklace for another giveaway - today is all about her fab new design called The Gabrielle (not available in her store at this time either). 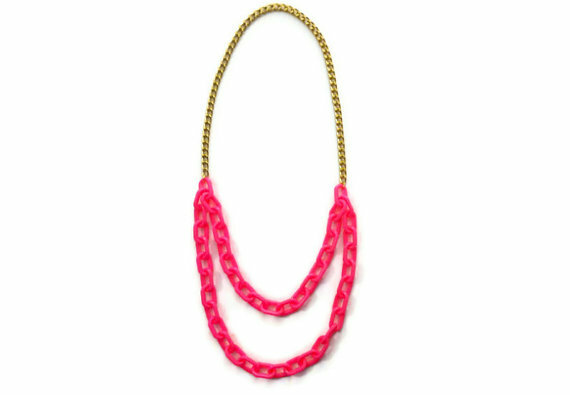 This hot pink and gold chain necklace is a super fun design that is the perfect pop of color to the Spring/Summer wardrobe. Since this is my first give away your chances to win are truly on your side! See below how to enter to win this gorgeous necklace and check back Monday, April 30th 2012 to see who the lucky winner is! How to enter the Dooley Noted Style & Spike the Punch Give Away! 3. Say hello by leaving a comment below & tell me why you love the Gabrielle necklace! The winner will be announced Monday 4.30.12 - Good Luck!!! The styling ideas with this gorgeous neon chain necklace are endless but below is exactly how I would wear it - how will you style spike the punch jewelry??? Like the look??? Go get it!!! LOVING the Gabrielle necklace with its classic links and trendy neon punch! Can't believe you were able to score a Rainey necklace! Lucky lady! I just started following @Spikethepunch_ and liked the FB page as well! Her jewelry is so beautiful and for such and amazing price! I LOVE the color and think it would look great in Western Australia! I love the Gabrielle necklace because it's an easy way to dress up neutrals that I tend to always wear. Plus, it will certainly fit me for the next 5-6 months, even tho none of my clothes will! This would look fab over a striped maternity dress! Love anything pink! What a cute/fun necklace!! I'm amazed at how hard these are to get your hands on!! Great job Heid!! i'm wearing my first ever Spike the Punch necklace today actually, and featured it today on my own blog as a friday fun find!! it's the addison and i love it. I LOVEEE this one too though--my favorite combo of pink and gold!! you can call me CupcakesOMG! I am SOOO excited about this give-away! I have had a really hard time scoring Spike the Punch pieces so far, and this is the perfect opportunity! I loveee "The Gabrielle" -- it will add the perfect pop of color to any of my outfits for spring/summer! Oooh I'd love to win! Hello! I'd love to win the necklace :) Spike the Punch is awesome! Such a sweetie! Loving all the neon i'm seeing around these days!!! I love the neon! It wold look good with a crisp white blouse! I follow STP on twitter! Happy Friday! You must be super excited about scoring a Rainey! I have been trying for months. I have 4 other STP pieces, and love them all! I don't have this one though, so hopefully I will get lucky :) I love the neon pink with the gold chain. Anything STP puts a smile on my face. I like Dooley Noted Style on Facebook and I followed on Twitter. I like Spike the Punch on Facebook and I follow on Twitter. Hello Heidi! This is Heidi! :) I love the necklace because it will definitely take a basic outfit and turn it into a fun outfit. I follow STP on twitter too! ...and I'd love to win this giveaway because I have nothing in neon!! I've been on the hunt for the perfect neon piece to add to my collection, and I haven't found it yet. This necklace would be perfect! I'm huge fan of bright pink this season, which is why i love the piece! I follow both you and STP on twitter! I am a huge fan of pink and a huge fan of bold chunky necklaces!! It can dress up any outfit!! I love pop of colors with neutral outfits :) And I love the writer of this blog!! I follow STP and DNS on facebook! love STP and LOVEEE the pink! Heidi - love your website and am now following STP on twitter. The necklace is beautiful! p.s. I like you both on FB! I loveee STP. I am so jealous that you got a rainey. I feel like I always just miss the twitter post! I even had my boyfriend start following her to try to get one haha! This necklace is gorgeous too, I love the pop of pink. I recently discovered Spike The Punch and I'm obsessed! This pink and gold necklace is darling, as expected. I love the color, and I also love how you styled it. Follow you both on FB and Twitter! Thanks for having this amazing giveaway - I love that this necklace would make any ordinary outfit extraordinary!! I absolutely love this necklace (especially the name since I'm Gabrielle!)! This would be such a nice piece to have! I follow you both on FB and twtiter =) What a great giveaway! I love that necklace! It's such a great pop of color for spring :) I'm following you both on twitter from @ceperk! I love the hot pink and gold! Liked both you and STP on facebook. I love STP! I would rock this at Derby this year....if I got it in time. Followed you & STP on facebook and twitter. I love the pop of color this necklace adds to an outfit!! Nothing like fruit punch (pun intended) pink for the summer, and that necklace is an awesome length! I am in love with allllll her stuff! I have been dying to own a piece of her jewelry! Great giveaway & love your blog! I follow spikethepunch on twitter! Thank you everyone for the comments & following on twitter or likes on FB - having the hubs pick a name tonight & will announce tomorrow!! !